Anybody who was hoping the stalemate viewers were left with at the end of season four of AMC’s The Walking Dead would be resolved by a civilized, diplomatic negotiation between mutually consenting parties is going to be disappointed by No Sanctuary, the first episode of season five. Anybody who was hoping for something more in the Death Wish vengeance, fuel tank detonating, flaming face-munching, backwoods cabin nihilism ballpark will be very pleased. The Walking Dead’s creators promised a darker, more gruesome season five, after the group’s failed turn at rebooting civilization behind the walls of a state penitentiary last season. Andrew Lincoln, who plays Rick Grimes, recently told TIME the show is “entering the heart of darkness.” If the rest of the season operates on the same frequency as No Sanctuary, that will surely be the case. It was brutal from the first frame to the last. The episode begins with a flashback. Gareth, the emo-sadist leader of Terminus, is in a train car seemingly identical to the one Rick and most of the others will eventually be trapped in too. The screams of the living being tortured outside echo inside the darkened car. “We were trying to do something good. We were being human beings.” Gareth says to explain why the Terminus group put signs inviting the outsiders that are presumably tormenting them in. “What are we now?” asks one of Gareth’s friends. That question is the central one for the rest of the episode, possibly the rest of the season. On the one hand, we have the Terminus group which it is made clear was once a “good” community that was twisted into deceit and cannibalism. (The short version goes something like: they promised sanctuary, were overtaken by some bad elements, and had to become vicious to retake their territory. Along the way, they started eating the people lured to Terminus by the promise of refuge.) On the other, we have Rick’s group which has grown tougher but still has to decide what it will and won’t do. Carol, rocking a kind of Princess Leia on Endor outfit, is the key to the Terminus prisoners’ escape. She lights up a tank of gas, resulting in the most spectacular explosion in the show’s five seasons and giving Rick, Carl, Sasha, Michonne, and the others a chance to escape. Aside from Rick, Carol is arguably the most interesting character on the show in that she’s evolved so much. She began as a meek, battered wife and has been: a grieving mother, hopeless optimist, calculating pragmatist, zombie killing arts teacher, substitute mother, outcast, and now, it seems, prodigal daughter. This is also one of the most squirm-inducing episodes since the show began. Within the first five minutes, four people have their throats cut in preparation for group meal. Faces are eaten, walkers set alight. And we get a tour through a really unappealing human abattoir. (Which was grosser, the dangling bits of neck or the lazy susan of human flesh toward the end, you decide.) Ultimately, it all ends with some welcome reunions. The moment when Daryl and Carol see each other again is one of the most emotional since Rick was forced to end Shane in season one. 1 sharp object to the skull by Carol on the train tracks; 1 piece of rebar to the face by a Terminus member working the fence; 15 in the gas tank explosion Carol detonates; 1 by Terminus sharp shooters; 5 blown to bits by sharp objects as Glenn leads a raid on a cargo container filled with prisoners; 5 by automatic gun fire by Terminus forces; 1 by metal pipe by Daryl; 3 by brute force by Tyreese when he’s forced to protect Judith; 2 by blunt force by Daryl and Bob as Rick opens the box car door; 3 by knife by Maggie during the escape; 1 by knife by Tara; 1 by automatic gunfire by Rick; 2 by pipe to the face by Daryl; 2 by brass-knuckle knife by Rosita; 1 by handgun fire to the open mouth by Sasha; 1 by knife to the face by Bob; 1 by gunfire by unidentified shooter; 1 by baseball bat swung by Glenn; 2 by makeshift sword to the head by Michonne. In the last few shots of the episode, we’re taken back to the flashback to tie up Terminus’ origin story. 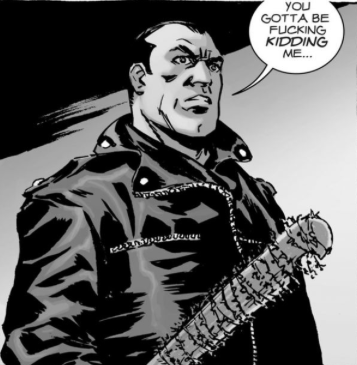 The antagonist looks a lot like Negan, the greatest, most fearsome villain in the comic book. Presumably, the Terminus crew took what they had back by force. But it might have been a glimpse at this. Gareth—still alive or dead? What’s up with DC? Eugene does not exactly seem like a genius. When he’s asked about the “cure,” he uncorks a jargon-laden spiel about weaponized diseases being used to fight weaponized diseases and a vague conclusion that humanity will be able to “fight fire with fire.” It basically made no sense, thought it seems to have convinced the rest of the group. We’ve seen it before here and there, but this was the first time we saw the group using a horde as an asset in a fight. Over the past seasons, the walkers have receded into the background as the main source of conflict (and terror). Other living people and strangers especially have become much more threatening. But it will be interesting to see if the walkers start being employed as pawns between groups of human beings.